Happy Spring! It’s hard to believe that Spring is finally here. It’s so nice to have the longer days. I always feel a bit more productive when the weather starts to get warmer. We had a busy and very successful March. Starting with MAND’s Annual Day on the Hill where we were at the State House educating legislators about diagnosing and treating malnutrition in older adults. We had a great turnout and some fantastic speakers. I hope you can join us next year. Visit the MAND Facebook page to see photos from the event. For the 3rd year in a row, Governor Baker signed an official proclamation declaring March as National Nutrition Month. This is such a great way to be recognized for the work that we, as registered dietitian nutritionists, do in the state. In addition, the MAND Board has been busy planning events for the Spring including an education event on nutrition and yoga on April 18th. There are also two Socials For Success events – Make Your Own Box on April 25th, 2019 and Serving the Community with Community Servings on May 10th, 2019. Check our website at www.eatrightma.org for more details and to register. We had some excellent award recipients this year. Congratulations to each and every one of the winners, they were so deserving. It’s wonderful to see RDN’s and students doing amazing things! Our Annual Nutrition Convention & Exhibition (ANCE) was held on March 29th at the Four Points in Sheraton. We had a sold out conference with over 400 attendees, excellent speakers, vendors and posters. Thank you to those who joined us and the committee that made the whole day possible. I look forward to it every year and it never disappoints! I’d also like to congratulate all of our new MAND Board elected positions. Our elections ran in March and we had some excellent candidates. Our membership activities and events couldn’t be done without our volunteers. I’m grateful to them every day for all the work they do. We still always have volunteer opportunities, so if you are interested in volunteering please reach out to me. We will continue to keep you informed on the latest issues and MAND’s efforts to promote and advance our profession. Be sure to follow MAND on social media (@eatrightma) and keep an eye out for our e-blasts for updates on what’s to come! Dr. Suzanne Neubauer is a Professor of Food and Nutrition at Framingham State University and was the Director of the Coordinated Program in Dietetics for 26 years. Suzanne has been an active participant in the Academy’s Nutrition and Dietetic Educators and Preceptors (NDEP) practice group serving as the NDEP Regional Director for the New England Area from 2012-2014. Dr. Neubauer has been teaching Medical Nutrition Therapy and supervising Coordinated Program students in their clinical nutrition practicums for over 40 years! She continues to be an inspiring, admired, and respected role model for future RD’s! Stephanie DeLaBruere is a UMass Extension SNAP-Ed Nutrition Educator. She provides nutrition education to over 3,000 students a year! When not in the classroom you can find her presenting food demos at farmers markets and teaching interactive workshops. In her free time, she enjoys new adventures such as attending a Brockton City Food tour or exploring the outdoors on a hike. She even recently ran her first half marathon at Walt Disney World dressed as Snow White, yellow tutu and all! 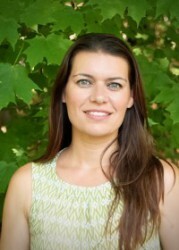 Adrienne Hatch currently serves at the MAND Director of Education and is a Registered Dietitian specializing in Military Nutrition at the U.S. Army Research Institute of Environmental Medicine (USARIEM). She works as a research dietitian and project manager on nutrition performance-based studies in active duty military personnel and has presented and co-authored publications on several studies. Adrienne completed her Masters degree in Nutrition Science from Purdue University and her Dietetic Internship training at the Mayo Clinic Florida. She remains passionate for understanding and implementing research-based practice contributing to future policy and performance optimization of military service members. Taelyr is currently a master’s student in the Coordinated Program in Dietetics at Framingham State University. She is president of their nutrition club, a faculty graduate assistant, and volunteer with Head Start. Her interests include pediatric nutrition with special interests in critical care and inborn errors of metabolism. She is excited to begin her dietetics career and enjoy lifelong learning and professional development! Lindsay is currently a dietetic intern at Massachusetts General Hospital. She received her B.S. in Allied Health Science and her M.S. in Nutrition and Health Promotion, DPD Certificate, and Certificate in Sports Nutrition. With a strong interest in pediatrics and nutrition support, she completed her Master’s thesis on the provision of nutrition support through procedures at Shriners Hospital for Children, which will be presented at the 2019 American Burn Association Annual Meeting this April. Lindsay looks forward to finishing her internship with a concentration in pediatrics and pursuing a career in this area of dietetics. The TB12 Method: How to Achieve a Lifetime of Sustained Peak Performance by Tom Brady was published in 2017, and quickly made the New York Times Best Seller list. At forty-one years old, the six time Super Bowl champion is still playing strong for the New England Patriots and has attributed his longevity to his stringent diet and exercise plans. In previous months, we reviewed Tom Brady’s recommendations for fluids, an alkaline diet and consumption of nightshades. In this final segment, we will review his recommendation for dietary supplements. The water-soluble B vitamins (such as thiamin, riboflavin and niacin) are especially important for carbohydrate and energy metabolism.6 B-complex supplements are often marketed to athletes as a way to enhance energy production. B-vitamin deficiencies can cause illness, however, these vitamins are well distributed throughout our food supply, making it difficult to become deficient without a severe caloric restriction.7 Research has not shown an enhancement of athletic performance in healthy adults supplementing with B-vitamins. Vitamin D is an important nutrient that is difficult to obtain from our diet. Bloodwork is the best way to determine if a supplement is warranted. TB12 recommends supplements of both vitamin D2 and D3.1 Vitamin D2 and D3 both get converted to the same final product, calcitriol.6 Taking both together is not likely to have a synergistic effect. Protein powders such as whey, soy, or creatine are highly marketed for athletes and people who are interested in “building muscle.” The protein RDA for strength trained athletes is about twice that of other healthy adults.6 However, most people (even strength-trained athletes) can obtain all their required protein from foods alone. There is no metabolic advantage to a protein shake compared to a high quality dietary protein, such as lean meat or eggs. Probiotics, often found in yogurt or other fermented foods, may influence the composition of your gut bacteria.6 However, research on this area is in the very early stages and not enough is known to make confident recommendations about probiotic supplementation. National Institutes of Health. National Institutes of Health State-of-the- Science Conference Statement: multivitamin/mineral supplements and chronic disease prevention. Am J Clin Nutr. 2007;85:257–64. Neuhouser ML, Wassertheill-Smoller S, Thomson C, et al. Multivitamin use and risk of cancer and cardiovascular disease in the women’s health initiative cohorts. Arch Intern Med. 2009; 169(3):1-23. Sesso HD, Christen WG, Bubes V, et al. Multivitamins in the prevention of cardiovascular disease in men: the Physicians’ Health Study II randomized controlled trial. JAMA. 2012;308(17):1751-60. Christen WG, Glynn RJ, Manson JE, et al. Effects of multivitamin supplement on cataract and age-related macular degeneration in a randomized trial of male physicians. Ophthalmology. 2014;121(2):525-34. Gropper SS, Smith JL, Carr TP. Advanced Nutrition and Human Metabolism. 7th ed. Boston, MA: Cengage Learning; 2018.